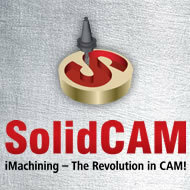 SolidCAM Indexial, Multi-Sided Machining - powerful and easy to use! ...The metal removal rates – Gigantic! Programming – super easy, superfast! Tool life - Awesome! Everything is exactly like SolidCAM have said! And it was just unbelievable..
2.5D Milling Module - Most powerful and easiest to create 2.5D CNC Milling toolpaths!